These framed Panel Scandinavian red pine will impress even the most skilled wood worker. 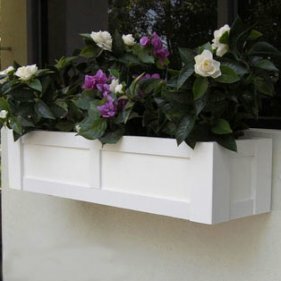 Finished on all four sides, these Framed Panel Window Boxes are made with furniture quality corners making them one of the highest quality wood window boxes available. 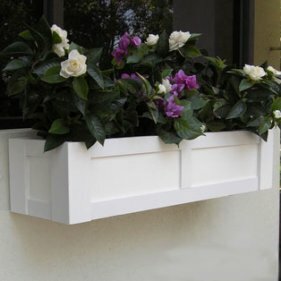 Each window box is truly a handmade piece of art that any homeowner will be proud to display. These window boxes can be finished in clear, golden brown, wild sage or white preservative. We also offer a selection of Farrow & Ball paint finishes. The embellishment of building with window boxes offer many exciting possibilities and well-planted window boxes can also relieve the dullness of blank walls or mask commonplace, unsightly domestic buildings, such as sheds. Container-grown plants can be placed at ground level, by windows and on balconies, hung from fixtures on walls or from porticoes, or suspended above doorways. Simple forms of dressing might use only one kind of container a window box or a set of window boxes, for example. More ambitious schemes might coordinate plantings in a range of planters - including troughs, window boxes and hanging baskets . come alive with bulbs planted in the previous autumn snowdrops, crocuses. dwarf daffodils, narcissi and low-growing tulips, hyacinths, scillas and dwarf irises. Many summer bedding plants grow perfectly in window-boxes, but avoid tall growing kinds which spoil the proportions of the window box. A charming-effect can be created by mixing trailing plants, like pelargoniums, lobelias and dwarf nasturtiums, with petunias, marigolds, Begonia semperflorens, tuberous begonias and salvias. Do not overlook dwarf shrubs and conifers which add form and permanency to a window box: potentillas, fuchsias, and the attractive little bulb Cyclamen coum, which flowers quite happily in shade in early winter.